Sarvangasana is the Sanskrit word where sarv = whole, ang = body parts, and asana = posture. It is also called the Shoulder Stand Pose. well in This Asana strengthens your entire body onto the shoulder. which is the best natural remedies for thyroid gland imbalance. It activates pituitary gland. 2. Raise your legs slowly upward and bring it to 90° angle while inhaling. 3. Now place the hands under the lower back at the waist level. Use the hands and elbows for support to raise your body up further. The breath should be held inside when you are raising the body to the vertical position. 4. Use the support of the hands to raise the trunk further up, till the whole body is vertical. Keep straightening the legs and spine by pressing the elbows down to the floor and hands into the back. Your weight should be supported on your shoulders and upper arms, and not on your head and neck. 5. In the last position, the body becomes vertical, like you created 90 degrees to the floor with chin presses against the chest. Pay attention to your neck. Do not press the neck into the floor. Keep your neck strong with a feeling of tightening with pressing your sternum. If you feel any strain in the neck, come out of the posture. 6. Keep breathing deeply and remain in this position according to your comfort. Do for 30-60 seconds in the beginning. For health benefits 3 – 5 minutes every day is good enough. Though practitioners can go up to 15 minutes for spiritual benefits. 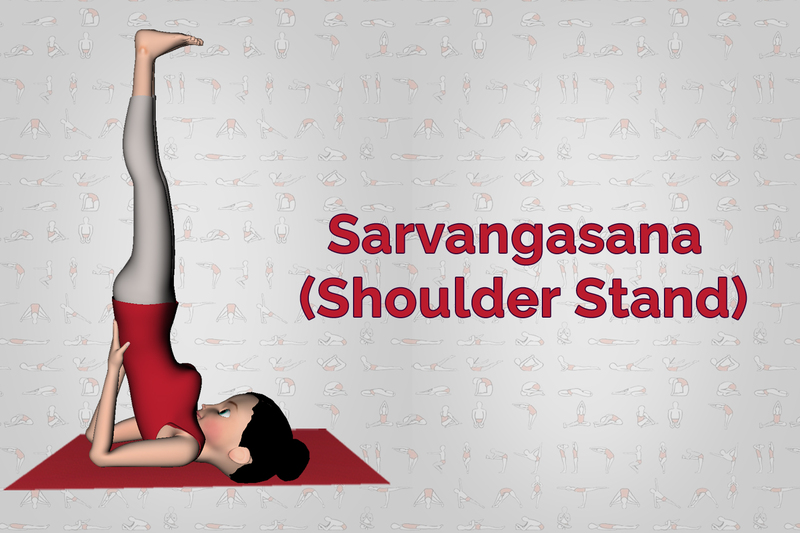 Sarvangasana is good for the healthy functioning of many organs of our body. Thus, it regulates the functions of all the glands of the body. 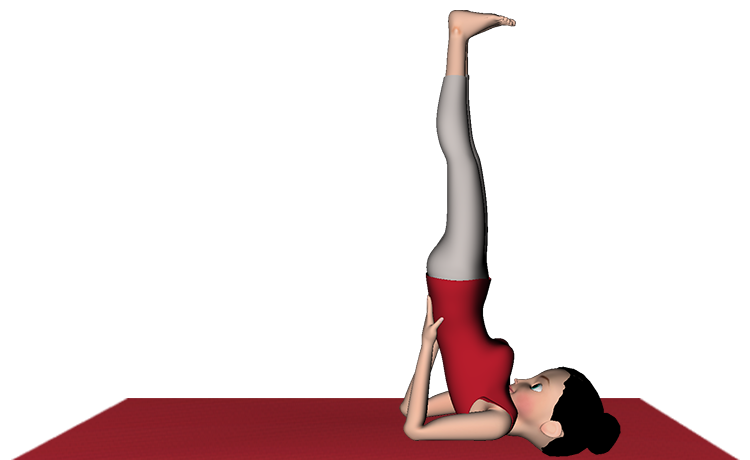 The chin press during Sarvangasana stimulates the thyroid glands. It smooths the metabolism functions in the body and helps to regulate weight. It takes pressure off the heart, which has to work less to get the blood flowing to the brain. Helps with lung functioning by improving blood flow to the area, making it useful for people suffering from respiratory tract disorders. It helps in making the immune system strong. Improves blood circulation to the scalp, in turn, helping the hair growth. If you are suffering from high blood pressure and asthma, support your legs with props while you practice this asana. Stop doing Sarvangasana exercise in case of a headache and weak blood vessels in the eyes. Do not be in a hurry to move fast while doing the asana, as it can put a tremendous amount of stress onto the spine. Halasana and Viprit Karni are recommended by many yogis with saravagansa.